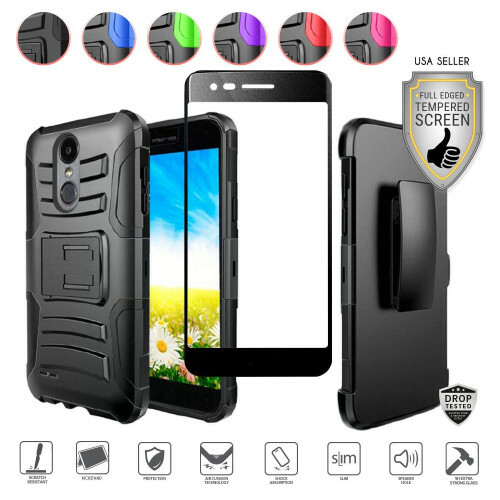 Heavy duty dual-layer protector case with holster. Built-in viewing stands for hands free media viewing access. Holster with adjustable belt clip allows easy access to your phone. Side grip design prevents accidental slippage. Includes tempered glass screen protector! 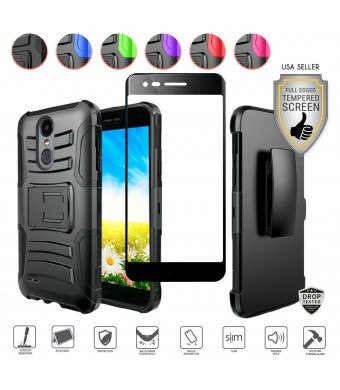 This heavy duty hybrid case consists of 2 layers of protection for your precious phone. Inner soft layer protects from minor drops and provide shock absorption. While the outer hard layer prevents from bumps, dents and scratches. Multiple viewing stands on both the case and the holster provides comfortable hands-free media viewing access. Adjustable belt clip makes it quick and easy to holster and access your phone instantly. Designed for perfect fit...it allows full access to all ports, buttons, and functions. This tough and fashionable case is the ideal choice for protection and comfort for your everyday use phone. Only compatible with LG Aristo 2/Aristo 2 Plus/Rebel 4/K8 Plus 2018/Tribute Dynasty/Zone4/Rebel 3/Fortune 2/Risio 3/Phoenix 4.